Firefighters in California are still working to contain destructive wildfires on opposite ends of the state. 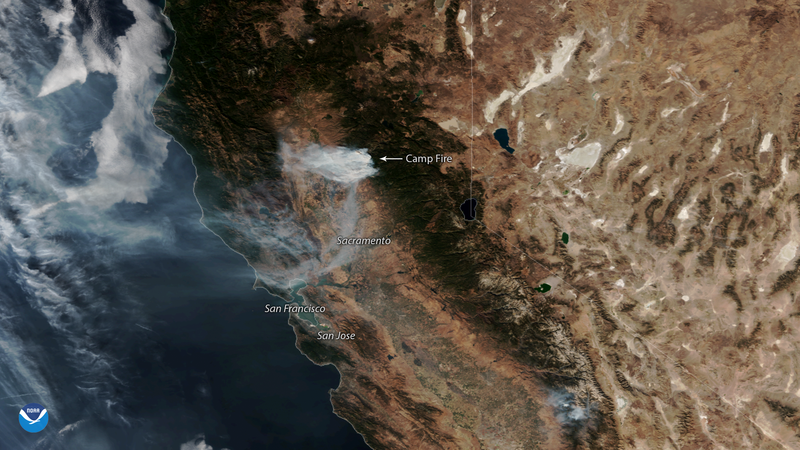 This image, captured by the NOAA-20 polar-orbiting satellite on Monday, Nov. 12, 2018, shows plumes of smoke from the fast-moving Camp Fire in Northern California. The Camp Fire covers 125,000 acres and is only 30 percent contained, according to the California Department of Forestry and Fire Protection (Cal Fire). The death toll from the blaze rose to 42 on Monday night, making this the most deadly wildfire in California state history. At least 200 additional people are still missing, according to officials. More than 6,000 homes and over 200 businesses have already been destroyed, and Cal Fire estimates that 15,500 structures are still at risk. The cause of the fire, which was sparked on Nov. 8, remains under investigation. In Southern California, two other fires have prompted evacuations in Ventura County. The Woolsey Fire, which isn’t pictured here, now covers more than 96,000 acres and is 35 percent contained. Two deaths and three firefighter injuries have been attributed to the blaze, according to Cal Fire. Although the damage assessment for the affected area is only 18 percent complete, preliminary estimates indicate that more than 400 structures were destroyed in the Woolsey Fire. The smaller Hill Fire, which covers more than 4,000 acres, is now 90 percent contained. Cal Fire estimates that both of the blazes in Southern California will be fully contained by Nov. 18. Extreme to critical fire weather conditions are expected to continue for Southern California through at least Wednesday, according to the National Weather Service (NWS). In addition, forecasters warn that strong, gusty offshore winds will continue to fuel both the Camp Fire and the Woolsey Fire. The blazes have also led to widespread poor air quality across California, which the NWS said could last throughout the week. The NOAA-20 satellite's VIIRS sensor provides global coverage twice a day with 750-meter resolution across its entire scan. Its daily multi-band imaging capabilities support the acquisition of high-resolution atmospheric imagery, including visible and infrared imaging of hurricanes, atmospheric aerosols and, as shown here, detection of fires and smoke.